Who Will Be Ethiopia's Next Prime Minister? After two years of unrest, the prime minister of second-most populous nation resigned. Activists hope Abiy Ahmed represents a new direction for the government, but some analysts aren't so sure. Abiy Ahmed was chosen by Ethiopia's ruling coalition on Tuesday to lead the party, meaning he will likely be become the country's new prime minister. He will take control of the Ethiopian People's Revolutionary Democratic Front (EPRDF), filling the gap left when Hailemariam Desalegn announced his resignation last month. "The EPRDF council has elected Dr. Abiy Ahmed as the leader of the party," the government-run Ethiopian Broadcasting Corporation said. Abiy will be the first person from the Oromo ethnic group -- the country's largest -- to lead the party in its 27-year-history. His appointment comes after two years of sporadic and deadly protests against the government, focusing initially on land rights before expanding to political and human rights issues. The protests initially consisted of Oromo activists before the country's second-largest ethnic group the Amharas joined the uprising. Hailemariam resigned to pave the way for reforms. Abiy took more than 60 percent of the vote from the 180-member committee of EPRDF elites, according to state-affiliated news outlets. Activists hope he will reform the party, which along with its allies controls every government seat. "He faces the tasks of widening political space and reaching out to the opposition. He will also have to respond to popular demands," Asnake Kefale, an assistant professor of political science at Addis Ababa University, told Reuters news agency. 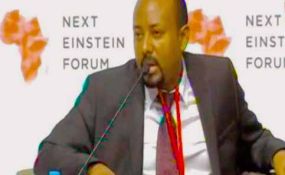 But some analysts cite Abiy's military background, and his alleged use of spyware against expat dissidents while director of the Information Network Security Agency, as evidence that he isn't a reformer.